So today on my lunch break, I visited Paulette's Donuts and Chicken in Leslieville. I'd been there before last summer but hadn't returned since I've been back in Toronto. It's a bit of a walk, but I was really craving their Macaroni and Cheese. Since the weather was warmer the last time I'd eaten there, I'd only ever tried their frozen hot chocolate. As delicious as that was, it was nowhere near as good as their spiced hot chocolate in the winter time. I had a cup of that while I waited for them to prepare my macaroni. It was funny because the last time I ordered it, it was just regular macaroni in a little container. Today, when I ordered, the lady kept saying I would get two balls of macaroni. I thought it was just a strange way of her saying that I would received two scoops. I didn't think much of it, until I received my meal in a tiny bag (no container). Apparently, they've switched up the recipe. The macaroni is now rolled in breadcrumbs into a ball and then deep fried. It was still delicious ... just not quite what I was expecting. Obviously, what they're more known for is their donuts and chicken. 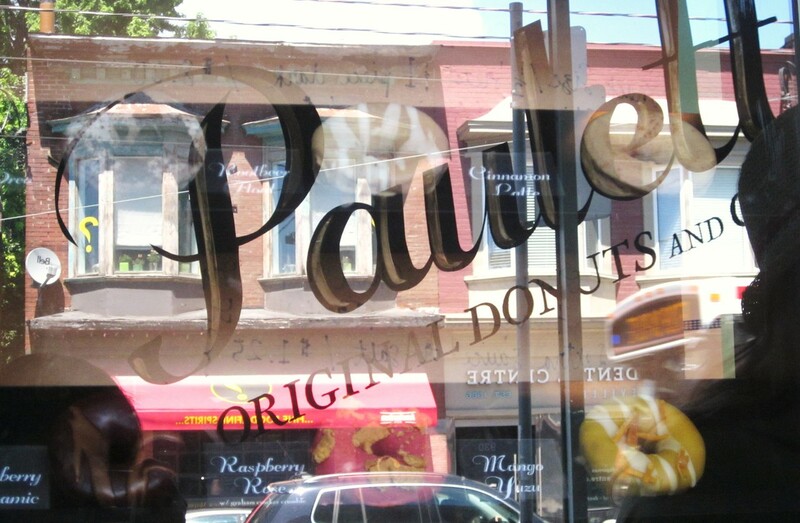 They have a variety of fancy donuts that they sell and that are displayed in the window. I know that they switch out the donut flavors from time to time, but it still gives people a chance to really try out a few of them. They didn't have the Oreo donut the last time I was there, but I'm hoping to go back and give that one a try.